An overtightened primary chain is known to cause premature failure of the engine, transmission and primary bearings as well as other complications. 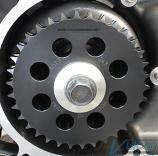 Usually, the factory automatic primary chain tensioner is the culprit. Our manually adjusted Primary Chain tensioner helps prevent premature engine and transmission bearing failure by allowing proper chain tension of 5/8" to 7/8" free play when cold.